1883 New York Harbor. Panorama of Manhattan South of Brooklyn Bridge—. Brooklyn was a vigorous and independent city, the third largest in the United States, when construction of the Brooklyn Bridge began. The cultural and social center of Brooklyn was the Heights, just south of the bridge. Lining the shore below the Heights and to the south were warehouses and factories serving the active port. The ferry lines carried over 50 million passengers per year, mostly commuters, to New York by 1870 and the numbers grew rapidly in the next decade. Governors Island . Just 500 yards off the Manhattan shore, Governors Island was designated by the New York Assembly in 1689 “for the benefit and accommodation of His Majesty’s Governors.” It had been known until then as Nutten Island. A series of fortifications, dating from 1794, have made it a major administrative center for the U.S. Army. During the War of 18 12 its strong defenses may have deterred the British attack of New York. The Coast Guard now occupies the site. Liberty Island . Liberty Island, formerly called Bedloe’s Island, was the ideal site for the great statue France presented to the United States in 1884 to commemorate the long alliance of the two nations. Called “Liberty Enlightening the World,” the stature was placed at the entrance to New York harbor by the sculptor, Frederic Bartholdt, where it could be seen by millions of immigrants arriving by boat. 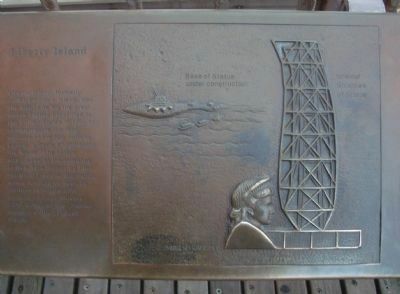 Gustav Eiffel designed the internal support of the 151 foot statue. Panorama of Manhattan South of Brooklyn Bridge . With no skyscrapers to block the view, a person on the bridge in 1883 could see from Brooklyn to Staten Island and over Manhattan clear to the Hudson and the New Jersey shore. The bustle of the city’s great port, one of the world’s busiest, could be seen below. An unbroken necklace of piers lined the eastern shore of lower Manhattan to 11th Street. From this harbor, steam and sailing ships left for New England, California, South America and Europe. The narrow, densely built streets of the port were crowded with warehouses, shipyards and small factories as well as with residences. Soaring above the low buildings of the city were the spire of Trinity Church, 280 feet high, and the tower of the Tribune Building. Ellis Island . Ellis Island takes its name from its owner in the 18th century, Samuel Ellis. Acquired by the federal government in 1808, it became an active arsenal for the U.S. Navy. In 1890, Congress approved the location of the New York Immigration Center at Ellis Island; in the peak year of immigration, 1907, over 1.2 million people entered the United States there. Brooklyn was a vigorous and independent city, the third largest in the United States, when construction of the Brooklyn Bridge began. The cultural and social center of Brooklyn was the Heights, just south of the bridge. Lining the shore below the Heights and to the south were warehouses and factories serving the active port. The ferry lines carried over 50 million passengers per year, mostly commuters, to New York by 1870 and the numbers grew rapidly in the next decade. Just 500 yards off the Manhattan shore, Governors Island was designated by the New York Assembly in 1689 “for the benefit and accommodation of His Majesty’s Governors.” It had been known until then as Nutten Island. A series of fortifications, dating from 1794, have made it a major administrative center for the U.S. Army. During the War of 1812 its strong defenses may have deterred the British attack of New York. The Coast Guard now occupies the site. 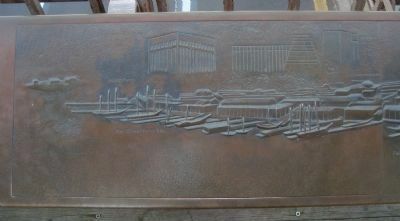 Captions: Brooklyn; Fulton Ferry; Home of Washington and Emily Roebling; Brooklyn Heights; Brooklyn Piers. long alliance of the two nations. Called “Liberty Enlightening the World,” the stature was placed at the entrance to New York harbor by the sculptor, Frederic Bartholdt, where it could be seen by millions of immigrants arriving by boat. Gustav Eiffel designed the internal support of the 151 foot statue. 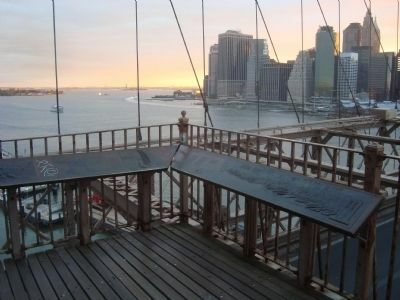 With no skyscrapers to block the view, a person on the bridge in 1883 could see from Brooklyn to Staten Island and over Manhattan clear to the Hudson and the New Jersey shore. The bustle of the city’s great port, one of the world’s busiest, could be seen below. An unbroken necklace of piers lined the eastern shore of lower Manhattan to 11th Street. From this harbor, steam and sailing ships left for New England, California, South America and Europe. The narrow, densely built streets of the port were crowded with warehouses, shipyards and small factories as well as with residences. Soaring above the low buildings of the city were the spire of Trinity Church, 280 feet high, and the tower of the Tribune Building. Captions: Buttermilk Channel; South Brooklyn; Governors Island in 1883; Castle Williams; Staten Island. peak year of immigration, 1907, over 1.2 million people entered the United States there. Erected 1983 by The 1983 Brooklyn Bridge Centennial Commission. Location. 40° 42.251′ N, 73° 59.672′ W. Marker is in Brooklyn, New York, in Kings County. 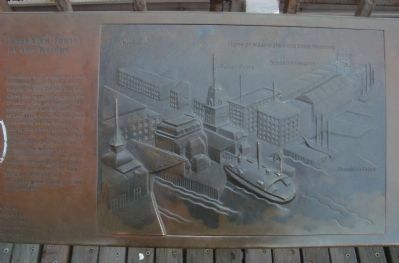 Marker can be reached from Brooklyn Bridge Promenade. Touch for map. 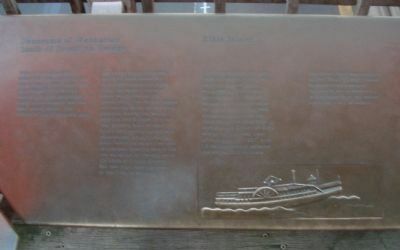 This marker is located on the Brooklyn Bridge Promenade at the south-east tower observation platform, facing Manhattan. Marker is in this post office area: Brooklyn NY 11201, United States of America. Touch for directions. Captions: Base of Statue under construction; Head of Liberty; Internal Structure of Statue. direct line); a different marker also named Brookland Ferry Landing (about 400 feet away); Brooklyn City Railroad Company Building (about 500 feet away); Eagle Warehouse (approx. 0.2 miles away); Walt Whitman (approx. 0.2 miles away). Touch for a list and map of all markers in Brooklyn. More about this marker. 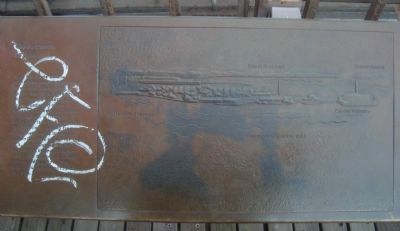 This marker is too large for a readable version to be presented in a single photograph, hence it is show in a series of images from left to right. Caption: Excursion steamboats such as the “Thos. P. Way” (shown below) carried pleasure seekers to ocean beaches and Hudson River recreation spots for a day of leisure. 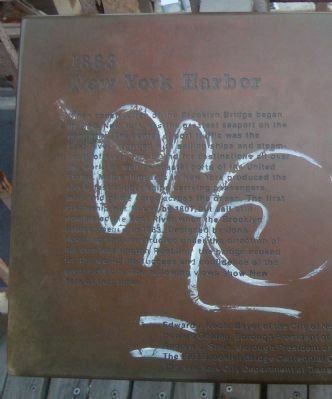 Captions: Ellis Island; South Ferry; Wall Street Ferry slip; 55 Water Street; Chemical Bank; 120 Water Street; Custom House; 180 Maiden Lane; Fulton Ferry slip; 50 Wall Tower; Trinity Church; Fulton Market at South Street; Chase Manhattan; World Trade Center; Pier 27 and 28 at Dover and Roosevelt Streets; Western Union; St. Paul’s Church; Park Row Building; Shot Tower; 225 Broadway; Woolworth Building; Post Office; Tribune Building. More. Search the internet for 1883 New York Harbor. Credits. This page was last revised on March 1, 2019. This page originally submitted on February 5, 2013, by Barry Swackhamer of San Jose, California. This page has been viewed 363 times since then and 7 times this year. Last updated on March 1, 2019, by Larry Gertner of New York, New York. Photos: 1, 2, 3, 4, 5, 6, 7, 8. submitted on February 5, 2013, by Barry Swackhamer of San Jose, California. • Bill Pfingsten was the editor who published this page.